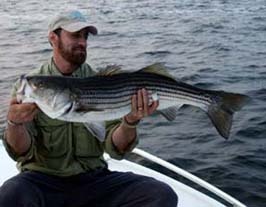 Book a Charter with me and I'll show you my Favorite Striper spots on Narragansett Bay. Narragansett Bay fishing charters during the RI summer have great fly and light tackle action for stripers. 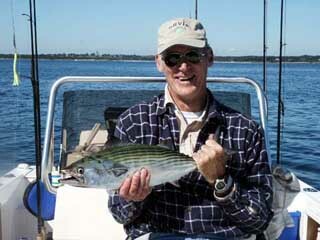 Book an exciting Spring charter for Light Tackle Fly Fishing on Narragansett Bay for Striped Bass. Narragansett Bay, Newport, Point Judith and Watch Hill. RI fishing starts in late April early May. Spring brings baitfish to Rhode Island for Narragansett Bay's many rivers and estuaries. You know that the Stripers are not far behind. Narragansett Bay's rocky shoreline offers many ambush points for the Stripers to hold, waiting for the dinner bell. They are opportunistic feeders and they never miss the chance for an easy meal. During this time with warming water temps they feed around the clock. Narragansett Bay often explodes with feeding fish on the surface, within easy casting distance of a fly fishing fanatic. The experienced fly fisherman can usually find Stripers chasing schools of bait, or holding on structure throughout the day. Schoolies are abundant on Narragansett Bay feeding on Silversides, CinderWorms, and Grass Shrimp. As spring draws to and end, the warmer days of summer move the Stripers to deeper water by day, feeding early morning and evenings. Then the Blue fish arrive. The feeding frenzy begins. Bluefish up to 10lbs. Take over Narragansett Bay. This is a great time for light tackle enthusiast. There is nothing sweeter than the sound of a singing drag, HOLD ON. For those who want to target Stripers, Newport's many reefs and Rocky shorelines with deeper cooler water, presents the opportunity for the light tackle enthusiast to land that trophy bass. There are other areas such as Narragansett County with its rocky shoreline, Point Judith and Watch Hill are only minutes away. Fly fishing the Watch Hill reefs can be quite an experience. Summer in Rhode Island offers a variety of species to target with fly rod and light tackle on Narragansett Bay. The best is yet to come HARD TAILS!! Bonito, False Albacore, Skip Jack Tuna. For light tackle these are by far the most challenging. There are no guaranties here. For those who hookup it brings the experience of a life time. This season starts in mid to late July through late October or early November. The light tackle enthusiast has a chance, on any given day, to catch Striper, Bluefish and a Hard Tail species all in one day. All this fishing available in one state: Rhode Island. Fall in Rhode Island is my favorite time of the year for fly fishing. Although it is not a good time to be a baitfish in Rhode Island. Acres and acres of small Bay Anchovie, being schooled up, ready for slaughter. The word CARNAGE comes to mind. Big fat hungry bass slurping around the surface on Narragansett Bay. False Albacore slashing through the middle of acres of Anchovies. Let me show you my favorite places….Lets HOOK UP.. Tight Lines. Come to Rhode Island for a fishing trip. You'll be glad you did. I am a Narragansett Bay Fly Fishing and Light Tackle Charter Specialist. Striper caught Narragansett Bay at Newport. Beautiful Striper fly fishing Rhode Island.